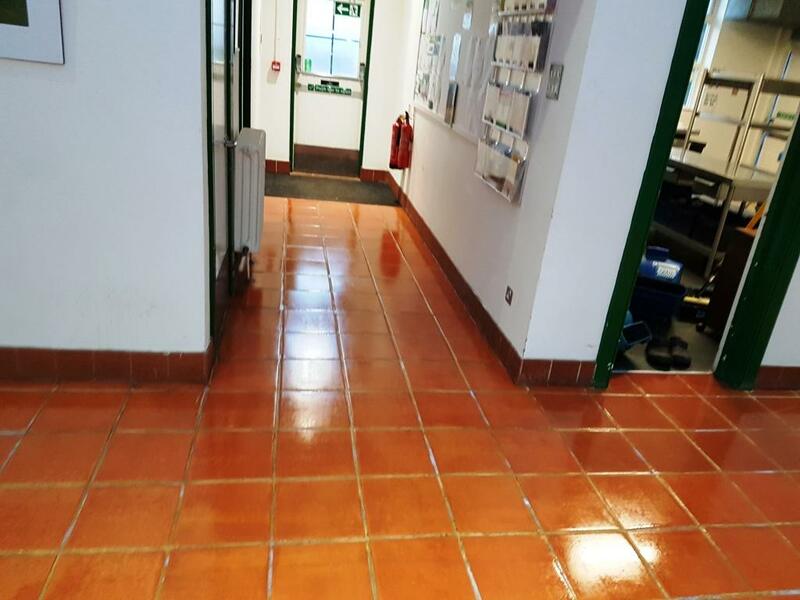 A local cleaning contractor called us in to work on the Terracotta tiled floors at a council building in Amersham. 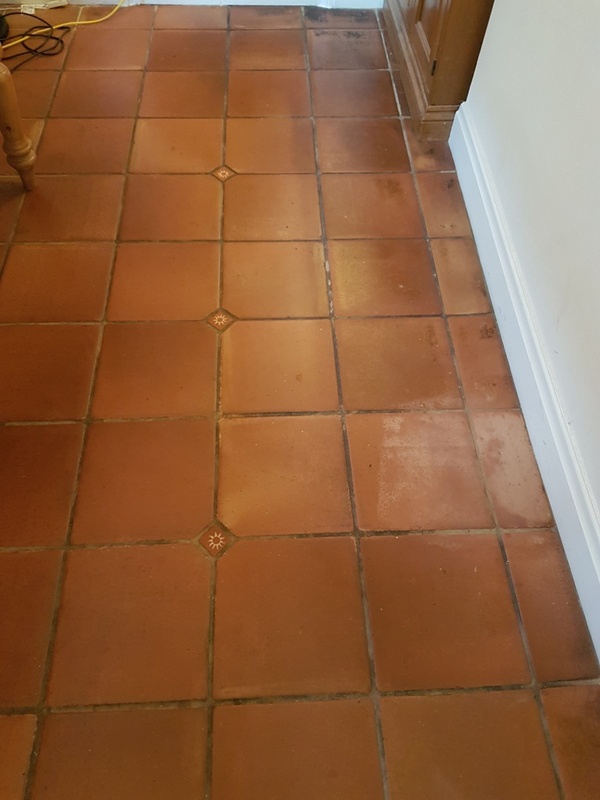 The Terracotta had not been deep cleaned and resealed for about ten years and the sealer had worn off leaving the tile vulnerable to dirt becoming ingrained in the pores of the tile. The grout had also suffered the same fate and had almost gone black in many areas. This is a common problem with Terracotta which is quite porous and once those pores become ingrained with dirt the tile becomes difficult to clean effectively. The solution is to seal the tile however sealers wear off over time and this was basically the problem. After discussing the issues we agreed on a plan of action to deep clean the Terracotta tile and grout and then re-seal to protect it. Due to the busy nature of the building we agreed to do the work between Christmas and New Year when we knew the building would be empty. 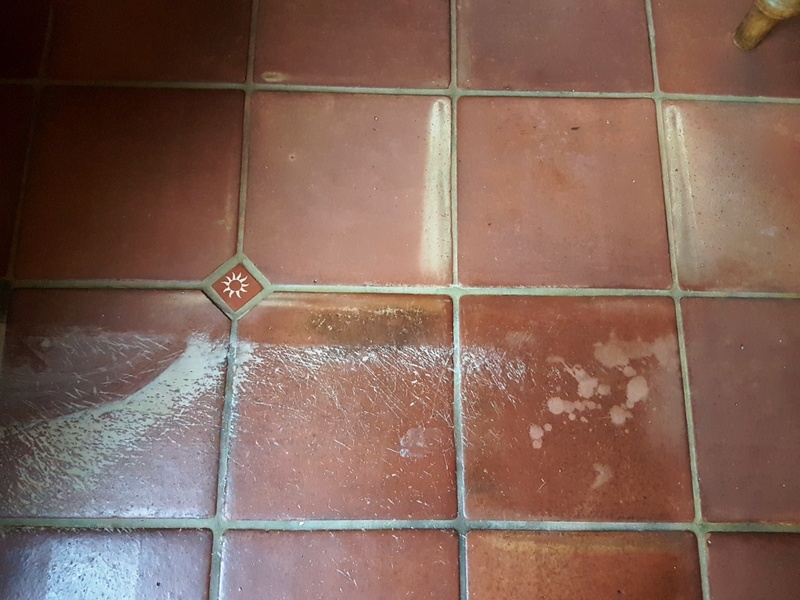 We started by applying a strong dilution of Tile Doctor Oxy-Gel which is a strong tile cleaning product that being in a gel form ensures it sits on the tile for longer, giving it a longer effective dwell time so it can really eat into and loose the dirt. After approximately twenty minutes the gel was scrubbed into the tile with a black scrubbing pad fitted to a rotary machine. This broke down most of the dirt and removed any remaining sealer. Once the whole floor had been treated in this manner it was rinsed thoroughly with water which was then extracted using a wet vacuum. With the soiled cleaning solution removed I could see the next step would be to spot clean stubborn staining and clean the grout. For this task I used a strong dilution of Tile Doctor Pro-Clean scrubbing it in by hand using stiff brushes and aided with a hand-held steamer to help treat the stubborn staining. Once done the floor was given a final rinse and then as much moisture as possible removed with the wet vacuum. We then left the floor to dry off completely and came back a couple of days later to seal the Terracotta tile. 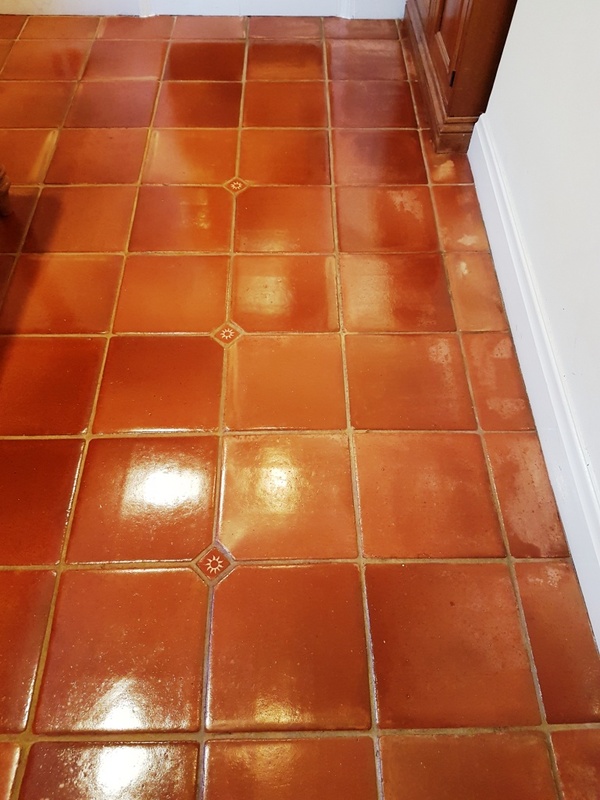 I mentioned earlier that Terracotta is porous; in fact it’s probably the most porous material I deal with, so to fully seal the floor I had to apply eight coats of Tile Doctor Seal and Go which will provide complete and long lasting protection against staining and dirt. Seal and Go also adds an appealing satin sheen to the tile and the new seal will make it much easier to clean in future. The floor tile and grout now look much healthier and I’m sure the council will be very impressed when they go back to work after the holidays. A few months back I posted a story about cleaning Catalan Terracotta tiles where I mentioned that Terracotta tiles are made all over the world. 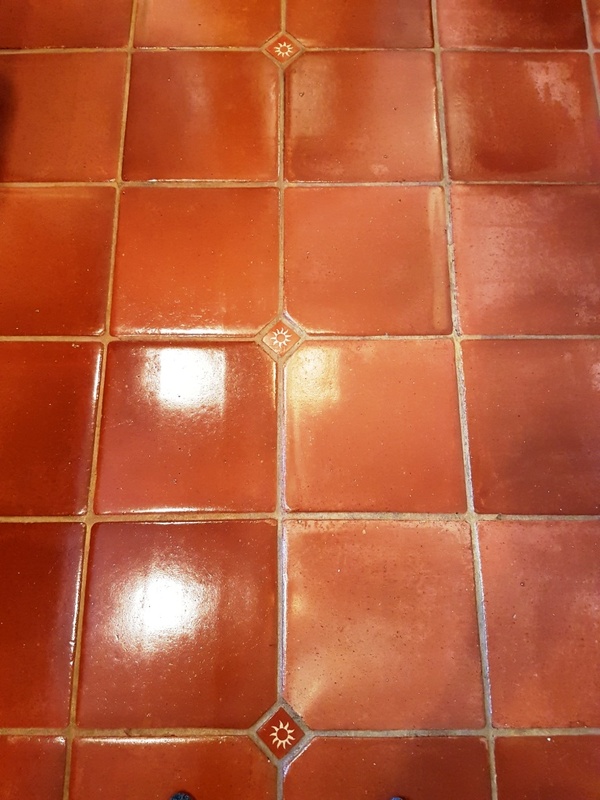 To prove the point I thought you might be interested to read about this Mexican Terracotta Tiled floor I cleaned recently at a house in York. The customer actually had two floors they wanted me to clean, the other was a Victorian Tiled floor which is cleaned using a similar process but I’ll post about that separately. 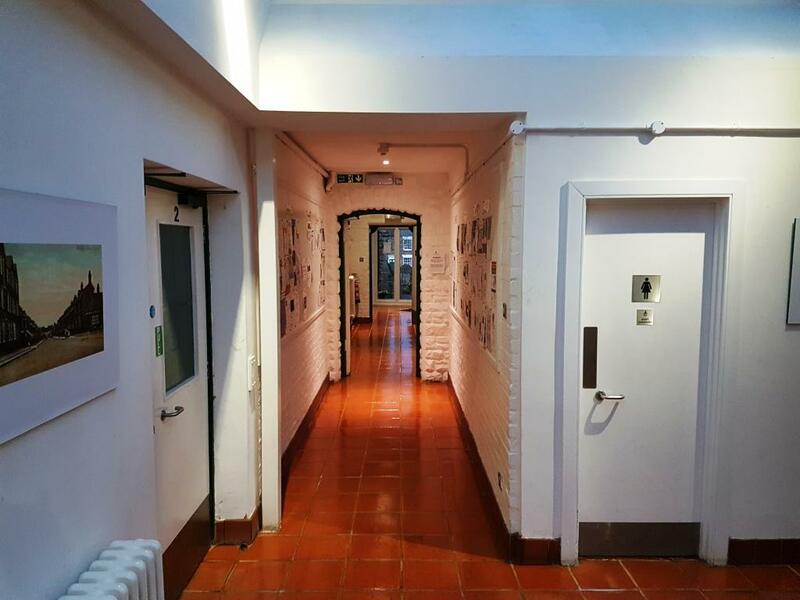 Both floors looked a bit tired but especially the Mexican Terracotta which looked dull and lifeless additionally the Grout had gone black when it should have been a Sandstone colour. Mexican Terracotta tiles are invariably hand made and made to the same standard as other makes such as Spanish, as a result the porosity levels between each tile can vary greatly which makes them harder to maintain. 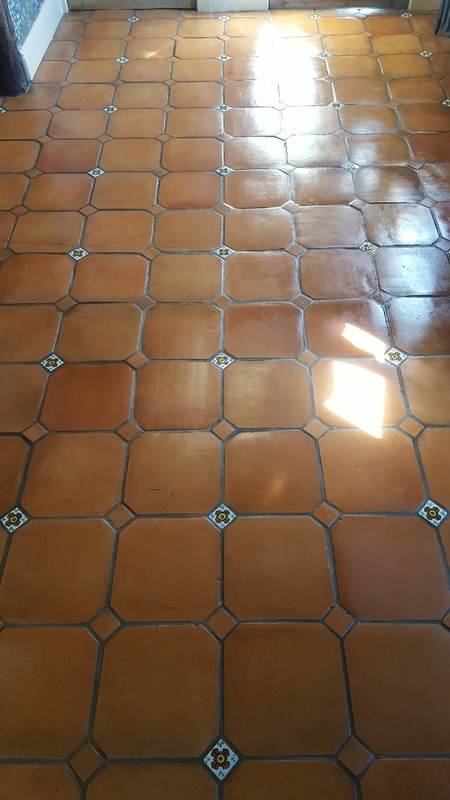 I cleaned the floor using a strong 1:3 dilution of Tile Doctor Pro-Clean with water which is an effective alkaline Tile and Grout cleaner that will clean and strip old sealers from tiles when used in a strong dilution such as on this occasion. I left it to soak into the tile for about ten minutes before scrubbing it in with a black scrubbing pad fitted to a rotary floor machine. This process made a different but the machine couldn’t cope with the “Bull Nose” edges to I had so spend a lot of time cleaning the old fashioned way using a scrubbing brush and a lot of elbow grease. I had the same issue with the grout which being slightly recessed wasn’t cleaned sufficiently by the machine; however I have narrow scrubbing brush that works well for this purpose. The floor was rinsed with water and the soiled cleaning solution was extracted using a wet vacuum. I could then see those area’s that needed more work and spot cleaned them with more Pro-Clean until I was satisfied all the previous sealer was gone and the tile and grout was as clean as it could be. The tiles were given a final rinse with water and the wet vacuum used again to extract as much moisture off the floor as possible. The next step would be to seal, however the tiles would need to be dry for that to happen and given Terracotta is notoriously porous and absorbs water quickly l decided after I’d leave the floor to dry out for two days. Upon my return to the property I ran some quick damp tests, which revealed the tiles were ready to be sealed. 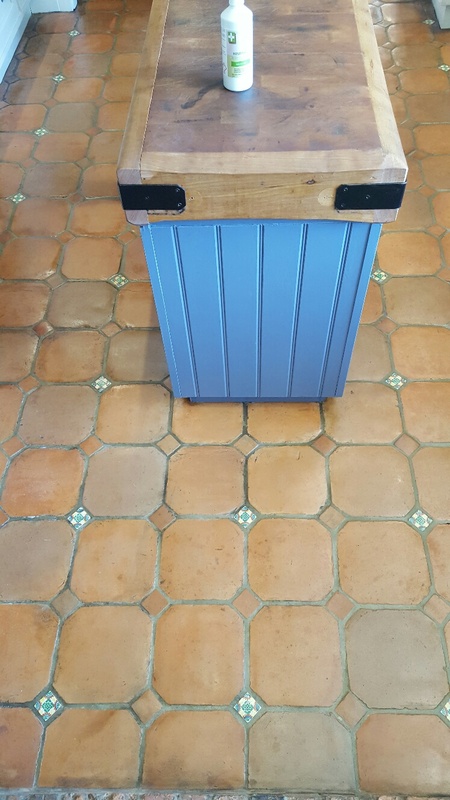 I then applied four coats of Tile Doctor Seal and Go which provides a satin finish and really improves the look of Terracotta. My customer was very happy with the transformation that had occurred to their floor and I think you will agree from the photographs the floor looks much healthier. Terracotta, terra cotta or terra-cotta meaning baked earth is a clay based tile which can be glazed or unglazed and were traditionally hand-made. Because of the material used to produce the tiles they are very porous and the firing process creates a lot of variation of colour not just between each tile but within each individual tile. The two main types of terracotta tile are Spanish and Mexican, or Saltillo, and have different colour variations and characteristics but are essentially treated in the same way. There are even some manufacturers that offer paw prints in tiles, although they cost extra! Of course, Terracotta is also commonly used as a material for tiled floors due to the warming and homely characteristics of the stone, associated with old country living. 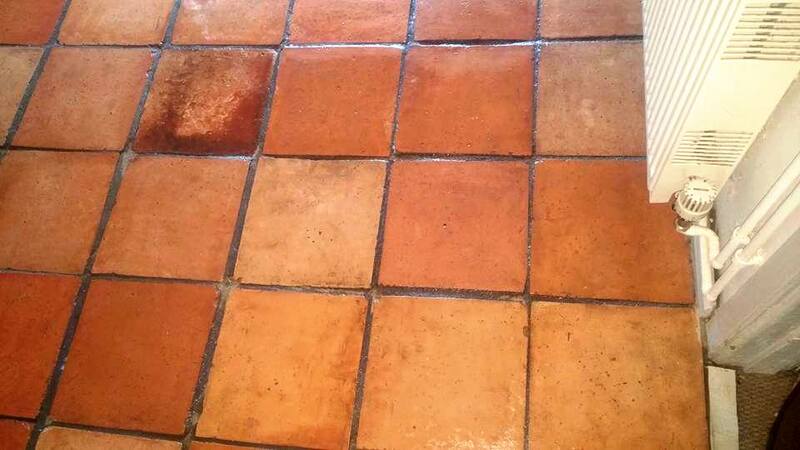 Indeed, a Terracotta tiled floor can be an asset to any home, but only if it is routinely maintained. 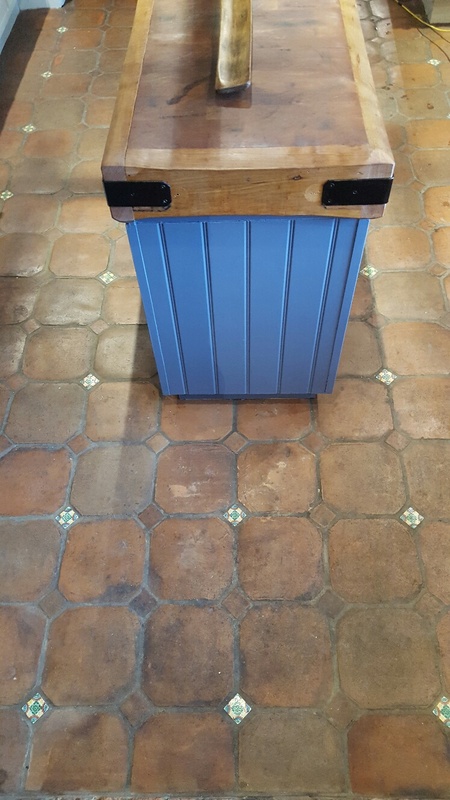 I recently visited a property in Lympstone, a small picturesque harbour village in East Devon in the area of Woodbury, to tend to a lovely Terracotta tiled floor that had been installed in an open-plan kitchen/diner. 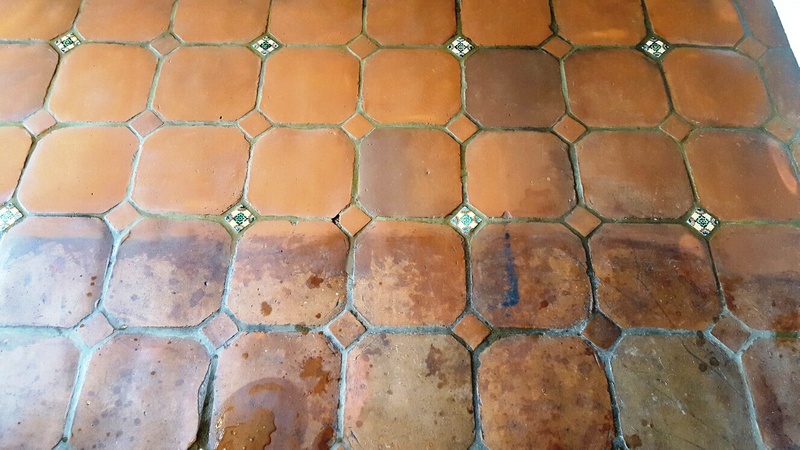 The tiles had gotten very dirty over its fifteen-year life and the current owners were struggling to clean it and had spent a long time scrubbing the floor with very little reward. Once on-site I conducted a small test clean on the floor which was very successful and gave the customers confidence in going forward. Happy to give me the work we agreed a date and I came back a few weeks later. Because of the undulation and texture in the tiles, the floor was treated using Tile Doctor’s Oxy-Gel, a powerful and fast-acting alkaline stripper/degreaser which is ideal for use on vertical surface and uneven tiles such as terracotta because the gel doesn’t run off the higher areas and pool in the lower areas. The product also has a short dwell time which enabled the entire floor to be cleaned in a day. 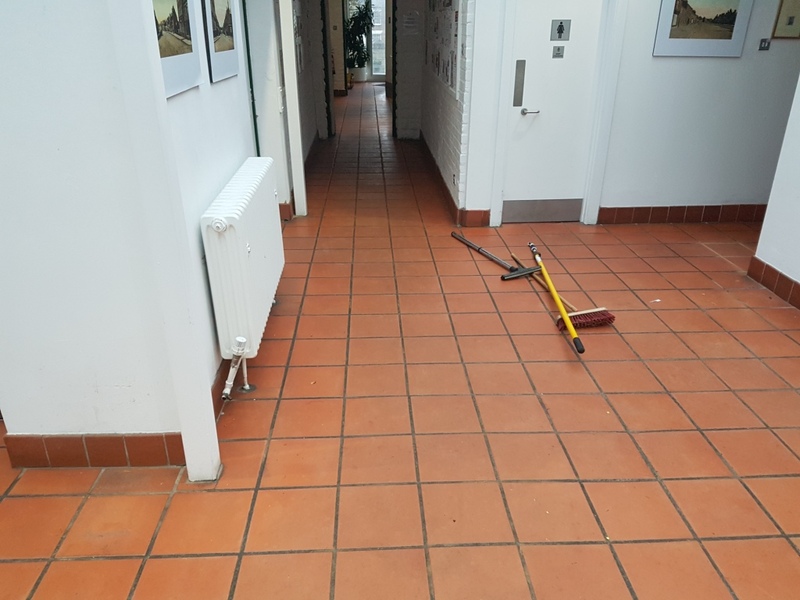 The Oxy Gel was scrubbed into the tile and grout with the aid of a stiff bristled monster brush fitter to rotary scrubbing machine. Once the cleaning process had been completed, I extracted the dirty cleaning solution using a wet vacuum and then re-treated any stubborn areas. Following the cleaning the whole floor was given a thorough rinse to remove any trace of cleaning product. This required a lot more water and brushing than usual because of the tiles acting more like a sponge because they weren’t sealed. Again, a wet vacuum was used to extract the water and get the floor as dry as possible. Because Terracotta is a very porous tile I left the floor for five days to ensure it would be dry enough when I returned to seal it. Tiles need to be dry before sealing as any excess moisture and damp issues can upset the performance of the sealer. I tested the floor for dampness on my return and found it had dried well and was ready to be sealed. This allowed me to proceed with sealing the tiles using Tile Doctor Seal and Go, which is an acrylic, topical sealer. It provides a both a stain resistant surface seal and a durable low-sheen satin finish. Being the product is water-based there no smell is given off by the sealer as it dries, and since the Terracotta is very porous I ended up using nine coats of sealer which is not uncommon on this type of tile. Once fully sealed the floor will not absorb water and so is easier to clean and much more resistant to staining. “Stuart was punctual to the minute and thoroughly friendly and professional at all times. Terracotta tiles are made all over the world and not surprisingly are very popular around the Mediterranean which is where these Catalan Terracotta Tiles were imported from. They had been installed in a large former farmhouse outside of Halifax in West Yorkshire about twenty years earlier and had never really been subject to an effective maintenance regime. They were now looking very tired and dirty indeed and well overdue a deep clean and reseal. 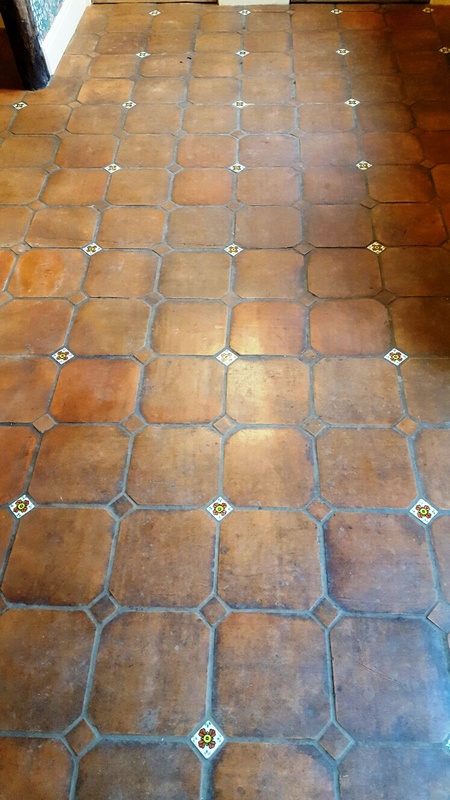 I cleaned the floor using a 1:3 dilution of Tile Doctor Pro-Clean with water which is an effective alkaline Tile and Grout cleaner that will clean and strip old sealers from tiles when used in a strong dilution such as on this occasion. I left it to soak into the tile for about ten minutes before scrubbing it in with a black scrubbing pad fitted to a rotary floor machine. This process got most of the dirt off but the pad didn’t have good contact with all the tiles as many were convex in shape as Catalan tiles often are. This became apparent after rinsing the soiled cleaning solution off the floor with more water and extracting the soil with a wet vacuum. To make sure all the missed areas were cleaned I applied more Pro-Clean and scrubbed them by hand with a scrubbing brush. I also took the opportunity to clean the grout as well which was a long job as the tiles were only 6 inches square so there was a lot of grout to do. 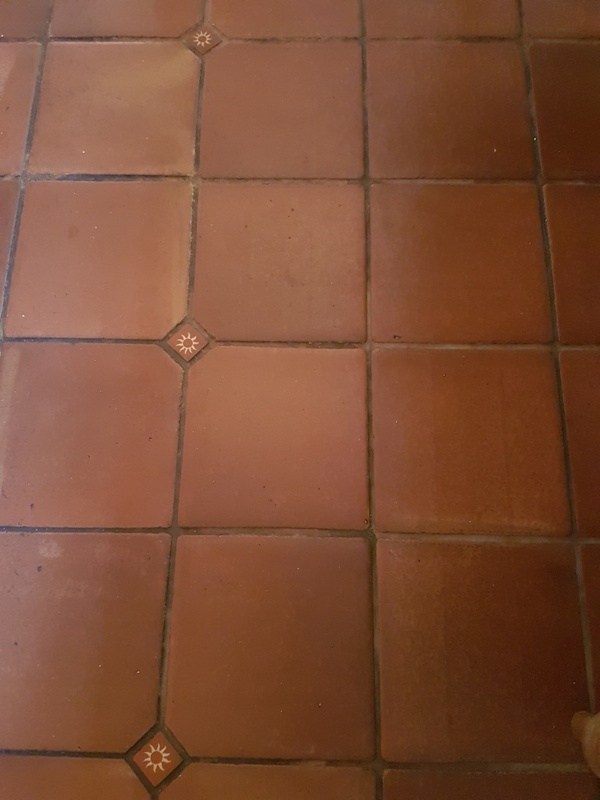 The little white tile inserts between the Terracotta tiles are called Tacos and they came up particularly well during cleaning. Once the clean had been completed I left the tiles to dry off for two days before returning to seal them. 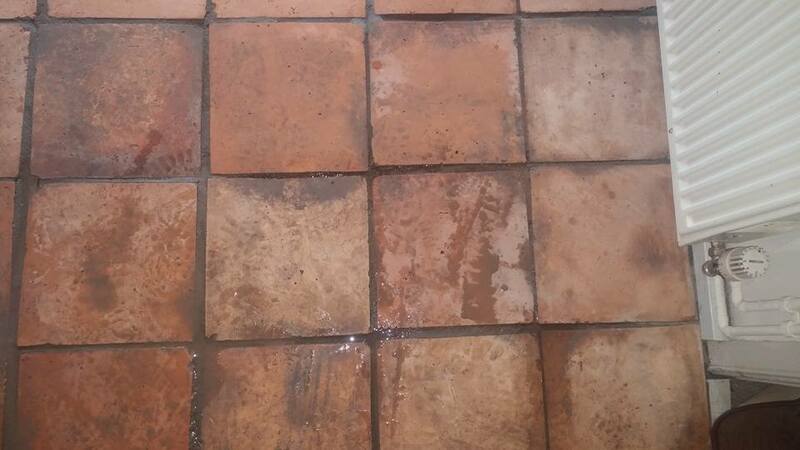 It’s important that the tiles are bone dry before applying a sealer as any moisture can cause unexpected results. Upon my return to the property I ran some quick damp tests, which revealed the tiles were ready to be sealed. 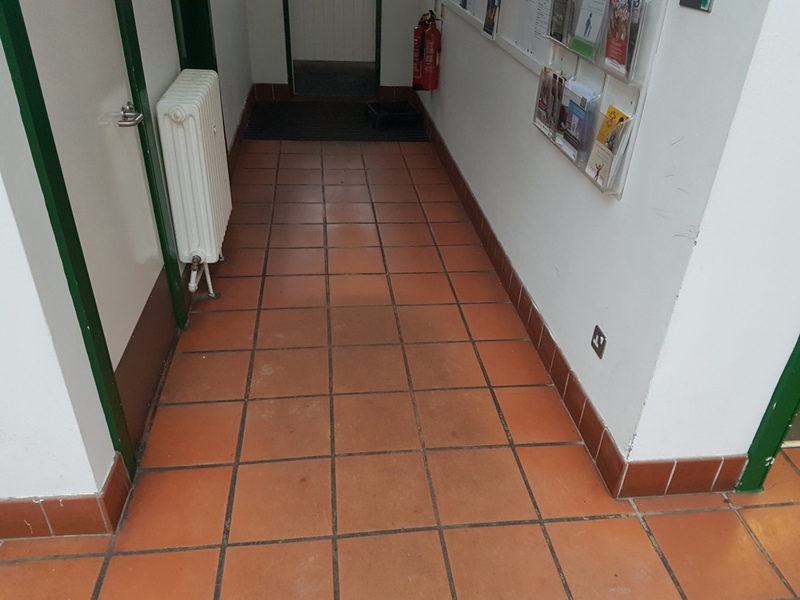 I then applied four coats of Tile Doctor Seal and Go, our topical sealer which provides a satin finish and really improves the look of Terracotta floor. My customer was very happy with the finished result and I think you will agree the floor looks so much brighter and healthier.